We are pleased to announce that the 2018 E.Virgil Conway College Scholarship and Isaac Liberman Public Service Award applications are now open. We look forward to hearing each of your stories. Remember to submit your application by June 22nd to be considered for these prestigious awards. 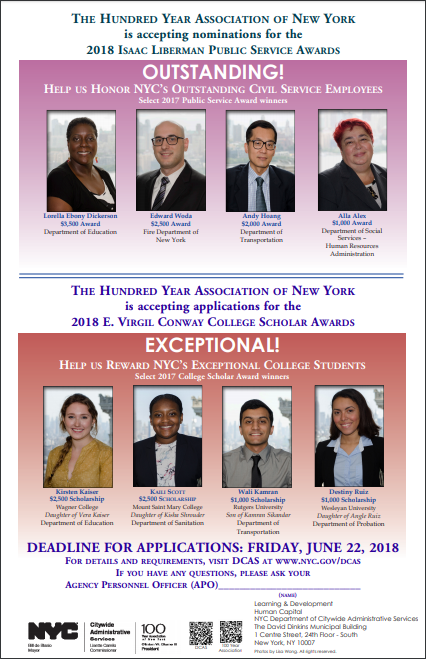 Print and sign the completed application and mail to the Department of Citywide Administrative Services, along with your essay and supporting documentation. Only nominations submitted by mail will be accepted for the College Scholar Awards.